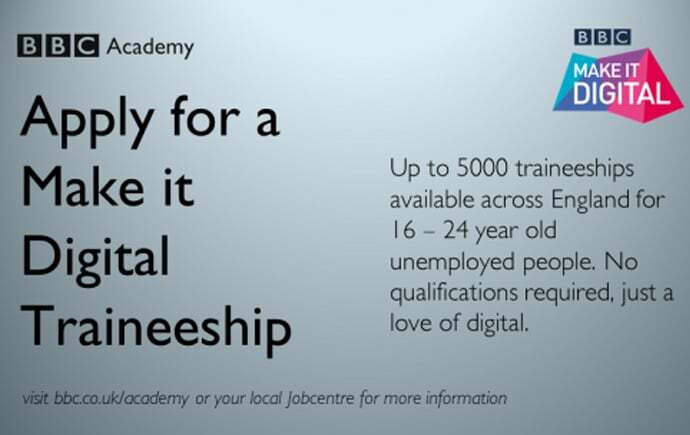 The BBC Make it Digital Traineeship are offering 200 16-24 year olds across Sheffield, Doncaster and Rotherham the chance to take part in a Make it Digital traineeship to help unemployed young people benefit from key hands-on training in the ever-changing digital age. Candidates can register their interest at their local job centre who will then play a crucial part in choosing suitable candidates to take part in the program. Once chosen, the successful candidates will be taught at their local training provider in Sheffield, Doncaster or Rotherham. During the traineeship, candidates will pick up key digital skills such as planning social media campaigns by researching previous BBC campaigns, building websites and creating short videos for the web. A crucial part of the scheme is the employability skills the candidates will gain along the way such as learning how to give and receive constructive feedback to help them progress in the workplace. Other key skills which the candidates are taught throughout the five weeks include: Budgeting, basic project management, team working along with English and Maths. The traineeship will also include a three-week structured work placement to help them put the skills learnt, into practice. Candidates who show strong potential will be encouraged to apply for BBC lead apprenticeships. The launch of the South Yorkshire scheme follows a successful pilot which ran in Birmingham earlier in the year which 50 people took part in, with 50% having received job offers eight weeks after the placement. Thee remaining candidates also went onto other apprenticeships to further their skills and employability.